People are not allow to shout at night because it’s rude and disrespectful to people who are sleeping. 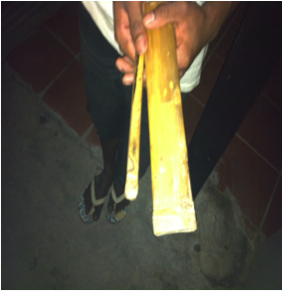 So people call out to customers by hitting sticks together and the echo sound is used for selling their noodles. People start selling the noodles at around 9:00 pm to midnight or sometimes later. At night you can notice them because there are two people, one is making noodles at the cart while the other one is finding customers by using the sound of their sticks. People who work at night or eat a late dinner can buy the dry rice noodles that are sold on the street. Dry Rice Noodles is made into a noodle soup that consists of energy. It’s known in Khmer as “Kouy Teav”. Noodles are made of rice that have been crushed into powder and then remade into noodles. They can be served at breakfast, lunch, dinner and desert. They are several ways the noodles can be prepared: dry noodles, noodles soup with pork, beef, chicken…etc. 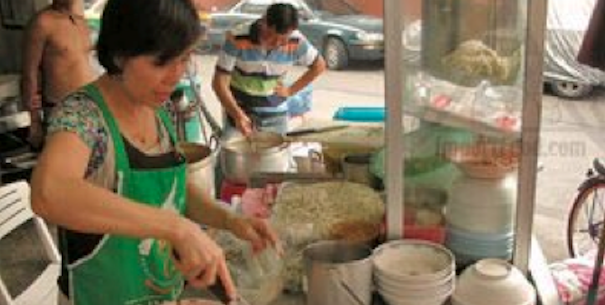 Mostly people sell the dry rice noodles on a moving cart or a standing cart along the street. The soup’s ingredients are specific to the owner’s cart – noodle, bowls, chopsticks or spoon, and sauce such as soy sauce, sugar, salt, pepper, ketchup and others. Customers can order small, medium or a large bowls. Small bowls cost about 3500 riel while large bowls about 6000 riel. The sellers usually shout out loud for customer’s attention to their business during morning or afternoon. People like to eat this noodle soup because it is really delicious. I would recommend to try it if you can.